Well wait a second. First, uncertainty isn’t the point of an election at all; otherwise, why not make it into a lottery? It’s to get the person who most represents the people into power. Second, there is no country where each candidate gets equal airtime, ad money, debating invites, etc. 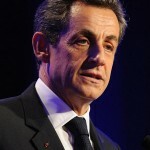 Cases in point: Ron Paul, Nader, Marine Le Pen, generic Green Parties and Pirate Parties, etc. Perhaps one day we will live in Internet democracies where anyone can nominate oneself and debates are won and lost via webcasts on Facebook but for now level playing fields are a fiction everywhere. 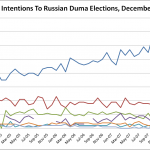 One can write a whole article on comparisons, but why bother when the Russian political scientist Evgeny Minchenko has already done an excellent job of picking apart these questionable assertions about how elections in Russia are much less free and competitive than in the West in his article Seven Myths about the Russian Elections? I translate his effort below. H/t @lindsey_bn for the link via Twitter. Myth 1 – A prolonged stay in power can be the basis for proclaiming the government illegitimate. Here we can look at the examples of Canadian PM Jean Chrétien – 20 years, Federal Chancellor of the FRG Helmut Kohl – 16 years. Ólafur Grímsson is the President of Iceland since 1996, and in 2000 his term of office was extended without elections as there was nobody willing to compete with him, he won the elections in 2004, he once again had his term extended in 2008 with no elections, and he does not exclude participating in the upcoming 2012 elections. There is a similar history with Chrétien and Kohl, although one has to note that it’s a slightly different state of affairs in parliamentary democracies. Myth 2 – Elite collusion, in our context the Putin – Medvedev “castling”, can be a basis for proclaiming the government illegitimate. Unfortunately, politics is structured in such a way that elite collusion does happen. A striking example is the history of Tony Blair and Gordon Brown. When they were nominating a candidate for Prime Minister, they agreed that Blair would go first, and then Brown. Vladimir Putin gave this very example: When Tony Blair stepped down after a scandal, there were no elections. Gordon Brown carried on for another three years as Prime Minister, with no elections, even though when the British voted for New Labour at the polls they were voting for Tony Blair as Prime Minister. On the other hand, when they finally did hold elections, Labour was crushed. In my opinion, this demonstrates that the public does have the opportunity to express their attitudes towards this kind of collusion. Our reaction was Bolotnaya Square and Prospekt Sakharova. Myth 3 – Harsh screening and disqualification of undesirable candidates in the Russian Federation. True, we have our Grigory Yavlinsky with his 1.5% rating who couldn’t take part in the elections, but I want to draw attention to what is now happening in the Presidential campaign in France. They have a very specific system in that the candidate must enlist the support of at least 500 mayors or elected local officials. Despite there being 50,000 such officials in France, Marine Le Pen – who has a 17% approval rating – has yet been unable to collect these signatures. 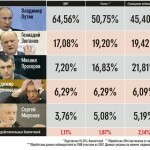 And this isn’t Yavlinsky, with his 1.5%, this is a person, who has a real chance of reaching the second round. I hope that Marine Le Pen will be able to solve her problem, as did her father Jean-Marie Le Pen; the ruling authorities were forced to command signatures to be gathered on his behalf after public pressure. There are various technologies for filtering out undesirable candidates. A striking example is the impeachment of Rolandas Paksas in Lithuania: Only after he left did it emerge that the court had pronounced him innocent, but by then he could not return to the Presidency. Another example – the story of Strauss-Kahn, who had a leading position among the French Presidential candidates, but who for reasons unknown to us could not take part in the elections. 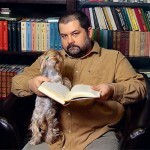 Bidzina Ivanishvili lost his Georgian citizenship, and is not allowed into the Presidential election. Myth 4 – The dominance of one party or one candidate in the mass media. I think this problem with access to media resources exists everywhere. It’s obvious that in the US candidates from the two key parties dominate over all others. On the other hand, it’s worth pointing out that the benefits which Mikhail Prokhorov enjoyed on Russian TV channels in the last elections were for a long time enjoyed by no other candidate. 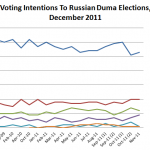 Myth 5 – Vladimir Putin declined to participate in the debates, so the elections were illegitimate – the voters didn’t have an opportunity to assess him. Let’s take a look at other countries. There were 23 candidates in the last US elections. For instance, Ralph Nader was registered in 48 states out of 51, but the elected Obama debated exclusively with McCain. Having a minimum of 15% in opinion polls is a condition for participating in US debates. Or what about France, 2002 – Chirac vs. Le Pen. As a rule, there are no debates prior to the first round in France. The tradition of holding debates only applies to the period between the first round and the second round. Mikhail Saakashvili, who is frequently portrayed as a great democrat, has never debated anyone in his two Presidential elections. Myth 6 (very common) – Russian legislation creates comfortable conditions for electoral falsifications. The suggested solution – rewrite the laws so that they match those of normal “democratic countries.” But the problems aren’t in the laws. As a matter of fact, ours are very stringent. They say, “Let’s abolish early voting!” But in the US, typically up to 30% of voters cast their ballots early. As for procedures on allowing observers into polling stations in other countries, in France you have to be a member of the Electoral Commission to observe the voting, and in the US observers are frequently denied access, especially foreign ones. In terms of observer access to polling stations, Russia is actually one of the world’s more liberal states. Myth 7 – Big protest actions are a cause for a revision of the election results. One striking example – the attempted “Cactus Revolution” in Mexico in 2006. Compared to our modest turnouts, in Mexico up to a million people took to the streets. At the same time, there appeared the following phenomenon: “And I don’t know why this candidate was elected, none of my acquaintances voted for him.” The specific cause of this lay in López Obrador being Mayor of Mexico City, and dominant in the capital and the adjoining southern regions, where many people genuinely didn’t know anyone who voted for Calderón. Nonetheless, all those protests came to naught. For the elections to be more honest and transparent, we need to have an independent judiciary, and opposition representation in parliament and the regions. I think that if there were to be elections for governors, they would enable them to reallocate administrative resources between the various parties. Inter-elite conflicts, a stable tradition of political competition – which we still have to work out, as it unfortunately isn’t double within 20 years – independent media, true federalism, and so those proposals that were made by Medvedev are, in my opinion, adequate: The liberalization of political party registration, and the transition to direct elections of governors.